Stanley Porter is a singer, songwriter and recording artist who is known for his unique brand of Urban Gospel. Captivating audiences with his seemingly boundless energy, he is a well sought after musician and performer. In 2001 he founded 4:12 Records, a gospel record company. Since then the artist has written and produced over thirty songs and three albums, his latest being the 2008 release, “All To You”. In 2006 Porter’s song, “Spiritual High”, was included on the Stellar nominated compilation Gospel Skate Jams Vol. 2. Porter’s body of work grows out of his experience living in urban America . Heavily influenced by Hip-Hop, R&B, Jazz, and Soul, Stanley’s music finds itself welcome in a variety of settings. The artist performs in churches, cafes, schools, and at community events. His performances usually include sharing the real life inspirational stories behind the songs he creates. In addition to recording and touring, Stanley has been a church musician for over 15 years and worked for nearly a decade as a professional teacher in the Boston Public Schools. He has also served as an expert panelist for several forums, conducted workshops on gospel music, taught many choirs, and engaged audiences as the television host of BNN’s Dreamchaser Gospel Talent Showcase. An anointed songwriter and recording artist, Stanley Porter is poised to become one of the great gospel music contributors of our time. "All to You" Reviewed by RadioIndy.com! "All To You,” is the third album from urban gospel artist Stanley Porter. This release highlights his unique blend of gospel, soul, hip-hop, and R&B. Creating a spiritual experience is the theme of this album, and Porter delivers. Porter combines electrifying, danceable beats with heavy synthesizers and sincere, passionate vocals. He delivers a diverse collection of songs with spiritual, glorifying lyrics unique to his incredibly personal style and to the genre as well. The production is ambient and rich, sounding very professional throughout. Great vocal harmonies and layering is a trademark of Porter’s sound. The inspirational anthem “Pray” and the silky “Everything” are perfect examples of this. Also listen to the expressive vocals on the moving “Speak” and the soulful “Righteous.” Porter gives us a taste of his style of hip-hop with the uplifting track “Press,” where he combines an aggressive groove with his distinctive, storytelling rhymes. Porter has produced an impressive collection of spiritually progressive songs with “All To You,” which has a lot to offer for fans of contemporary gospel and Urban/ R&B alike. 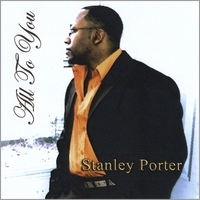 RadioIndy is pleased to present Stanley Porter with a GrIndie Award for the CD "All To You"